It’s that time of the year again when the world’s tech industry descends upon unsuspecting Hannover for the CeBIT tradeshow, and despite having little more in our German phrase book than “ich bin ein bit-techer” we’ve made the trip to bring you all the tastiest news from this modern tech-mecha-mecca. As much as we'd like to tell you about our trip, the beer and the sausages, we're going to save all that until later and get straight on with the new tech. As CeBIT is one of the worlds largest tech trade shows it’s no surprise that Taiwanese tech giant Asus has a large stand, so that's where our trip begins. Remember the Asus Mars, the £1,000, limited edition dual-GPU graphics card? 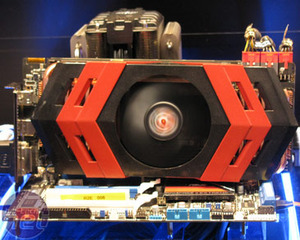 At CeBIT Asus was showing off the Ares, a similarly bonkers follow up, but this time, using ATI Radeon GPUs. 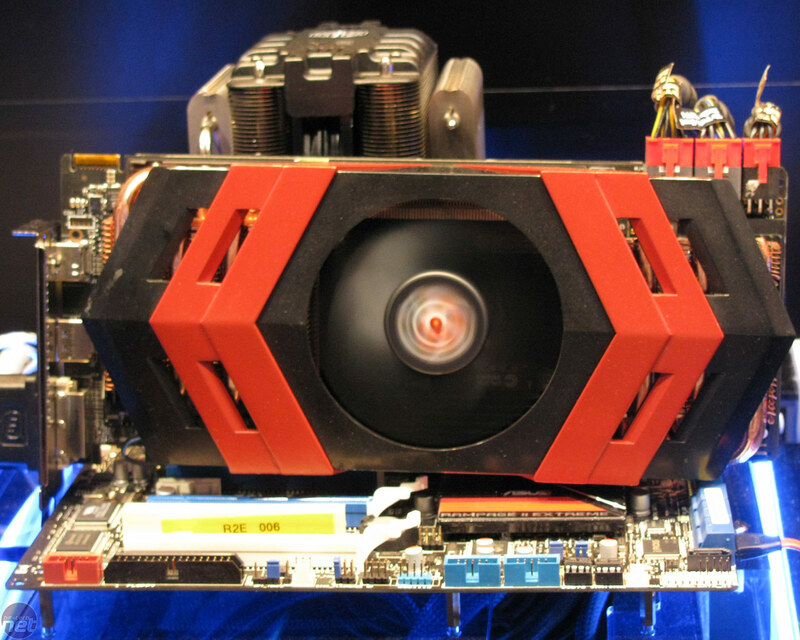 A rep from Asus called it “what the Radeon HD 5970 should have been,” and with two full fat, full speed HD 5870 cores, 4GB of GDDR5 and a massive custom direct contact heatpipe based cooler we’re inclined to agree. 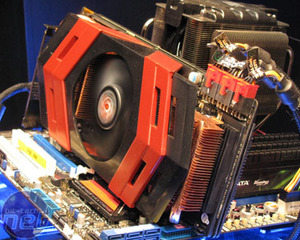 Power is delivered from two eight pin PCI-E power connectors and a third six pin power connector and the whole package is equally fantastic and insane. As with the Mars, there will be a strict 1,000 piece production run, and the price will once again come in at around £1,000 – one for the well-heeled amongst us who don't fancy buying a football club, then. We hope to get hold of one (and duly take it apart to show off Asus’ tech wizardry) as soon as possible – as long as Rich doesn’t break it first of course. 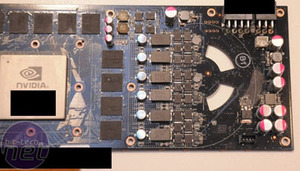 While Asus has taken its own path in crafting an ultra high-end graphics card, the really big GPU news at CeBIT, or rather world record tease, has been the lack of Nvidia’s latest Fermi GPU based graphics cards, the GTX 480 and GTX 470. 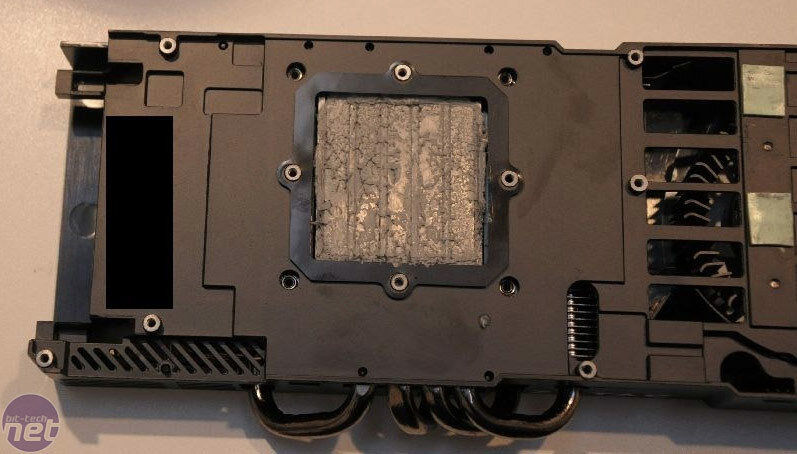 We have to wait until March 26th to reveal them to you in full, but to frustrate us (and more importantly, to placate grumpy board partners) Nvidia has furnished several firms with heavily guarded GTX 480 SLI demo systems for CeBIT. They're showing off Nvidia’s new tech demo, Supersonic Rocket Sled, a graphical showcase that makes heavy use of tessellation, DirectX 11 and PhysX on the new Fermi cards. 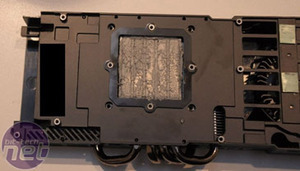 Happily for us though the internet will not be denied in its angry cries for info, and images of Nvidia’s latest stripped of its cooler and laid bare have now surfaced care of Dutch site tweakers.net. We already knew the cards would be toting 1.5GB of memory, but in the leaked shots you can see it comprises twelve 128MB memory modules and there's huge a quad heatpipe cooler to cool the massive GPU. Clock speeds, and exact technical specs still under wraps you’ll have to wait for our reviews for a proper judgement. We also had a chance to speak with numerous Nvidia partners who were overwhelmingly confident of stock being available at e-tailers for the release later on the 26th of March so while we’ve no solid info on pricing yet, it looks like availability will at least be fair for Nvidia’s new offering.